If you are an ardent fan of Harry potter books,you would have surely heard lot about this word cauldron. But i have never seen cauldron as cakes until Gayathri send us this recipe suggested by Archana for this month's Baking Eggless Challenge.Seriously when i saw this cake, i really want to make some soon as possible just to see how my kids will react to this beautiful very attractive cake. Finally i tried them this week, unfortunately i had hard time with the chocolate handles as they were seriously very fragile and i couldnt able to get them prefectly.Else everything came out extremely prefect and i filled my cauldron cake with mascarpone chesse filling. My kids just enjoyed having this beautiful cakes even i served them with broken chocolate handles,i'll be making again soon for my son's birthday. Yep this cake is pretty easy to make apart from the chocolate handles. May be with more concentration and patience,i think i'll be able to get those chocolate handles prefectly next time,fingers crossed.Do check Champa, Srivalli, Sumana Deepak,Veena,Jayasri and Preeti Deo wat they baked for the last day of bake-a-thon. Line the muffin mouls with paper liners. Sift the flour,cocao powder,corn starch,salt,baking soda and baking powder together. In an another bowl, beat together the butter and sugar until they turn smooth, add the yogurt,vanill essence and beat for few minutes. Fold in the flour mixture and mix gently with a spatula. Pour enough batter to the lined baking mould and bale for 15-20minutes and let them cool completely. In an another bowl,beat the mascarpone cheese and confectioners sugar until everything get well mixed. Gently fold the cream to the cheese mixture and mix well. Keep in fridge for atleast an hour before starting the filling. Melt together the chocolate chips with few drops of water in microwave oven for a minute, whisk well and transfer it to a pastry bag. Pipe it over a baking sheet as handles and keep aside until its hardens. Melt the chocolate with butter in microwave oven for a minutes, whisk well and keep aside for 5minutes,transfer it to a piping bag. With a cupcake corer or a sharp knife, cut out a cavity in the bottom of the cupcake,fill it with the already prepared mascarpone cheese filling. Original recipe went for dipping the top of the cupcake into the chocolate glaze,i just skipped that part. Now pipe the chocolate glaze around the edge of the cupcakes, place the already cooled chocolate handles on the top of the cupcakes. Last weekend, i finished some leftover brioche dough with apple slices as this beautiful apple pie for our evening snacks. 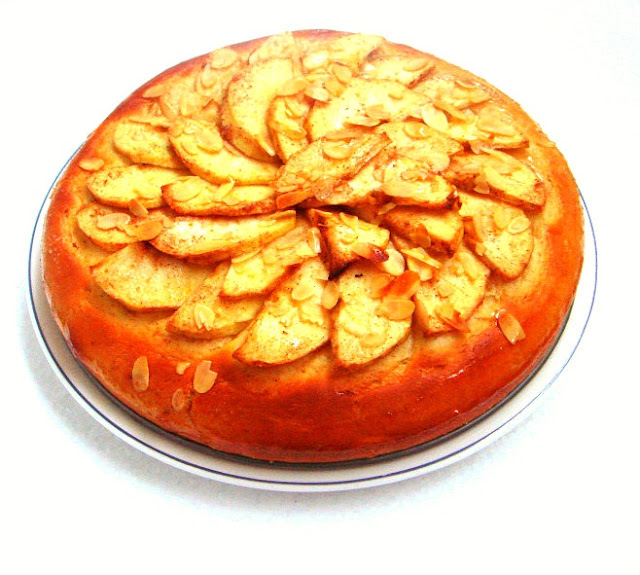 This brioche apple pie came out extremely fabulous, with simple ingredients this apple pie tastes simply awesome and personally this pie is one of my best bread i have ever baked.You doesnt need any spread to enjoy along with this pie. In case if you dont have apples, you can go very well for pineapples,pears or dry fruits for making this brioche pie,but somehow i prefer apples. Mix and match the fruits,if you want to make them slightly different from mine. You guys should give a try to this incredible bake and am sure that you will definitely love this. Meanwhile take the flour,egg yolk,sugar in a large bowl, add gradually the foamy yeast and turn everything as a soft dough, now add the butter and knead everything for 10minutes. Meanwhile mix the sliced apples,cinnamon powder and packed brown sugar in a bowl and keep aside. Knead the dough again for few minutes and roll as medium size disc. Arrange in a warm place until the dough double the size. Place gently the already spiced sliced apple slices on the top of the dough,sprinkle the silvered almonds. Bake for 20-25minutes, once the bread comes out of the oven,brush the top generously with honey and let them cool completely. We get easily oranges during winter in every corner of the street, yep here its a peak season and we never fail to get them. 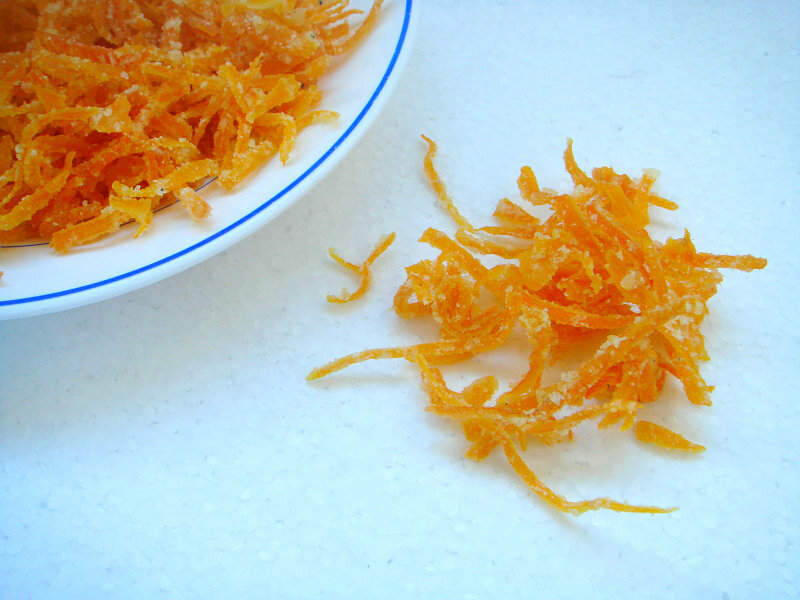 I tried my hands in making candied orange peels recently at home and they came out extremely fabulous. Its quite easy to make homemade candied orange peels which i used them in making a sweet bread recently with it. With a wonderful orange flavour, this bread will definitely suits prefectly for a breakfast,brunch or else for a quick snack. My kids just enjoyed having this bread, with nutella spread or a simple fruit jam this bread will definitely satisfy your sweet tooth. If you dont have candied orange peel, you can go very well with freshly grated orange zest for making this bread. 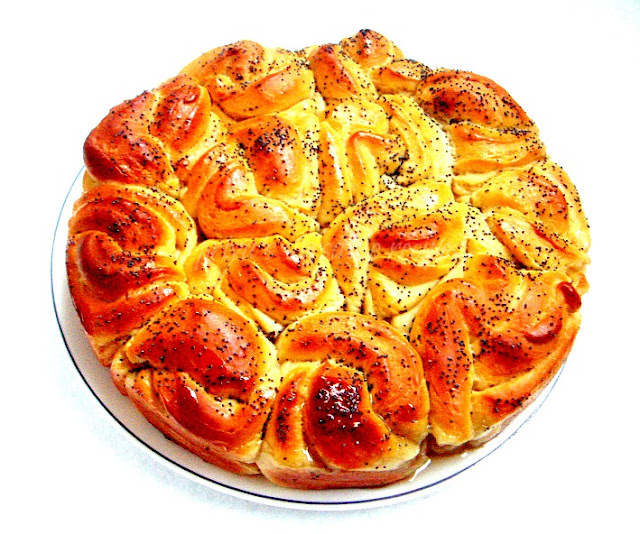 I used an egg in this sweet bread, you can skip them very well with silken tofu or with cream chesse as egg subsitute in this bread. Dont forget to make this bread,if you get easily and cheaply oranges. You can conserve very well candied orange peels in an air tightened box for more than three months even in room temperature.Do check Champa, Srivalli, Sumana Deepak,Veena,Jayasri and Preeti Deo wat they baked for the 13th day of bake-a-thon. Mix the warm water,sugar, yeast together,keep aside until its turns frothy. In a large bowl mix the beaten eggs,salt,melted butter,candied orange peels and flour together, add the foamy yeast mixture and knead along with orange juice as soft and smooth dough. Arrange the dough in a greased bowl and keep in warm place for an hour until the dough gets doubled..
Punch down the doubled dough and knead well. Divide the dough as 8-10 medium sized balls or else if you have loads of patience you can make your bread as i did. Place them in a greased round pan,cover the pan with a towel and keep again in a warm place, let it double again atleast for an hour. Once the dough doubled the volume, preheat the oven to 375F,brush the dough with egg yolk,springle the sugar pearls and bake for 15minutes. Turn down the oven to 325F and bake for 10-12minutes until the crust turns golden brown and the bread sounds hollow when tapped in the bottom. Enjoy for snacks or breakfast with any sort of spreads. I cant imagine preparing kurma without cashew nuts or else with freshly grated coconut. But recently for a change to our usual kurma, i tried my hands for a low fat kurma using yogurt,poppyseeds and roasted gram dal aka pottukadalai. This diet kurma turned out simply awesome, even the texture of this kurma ressembles quite like the usual coconut based kurma.Serve this kurma with any sort of dish, i can definitely say that everyone will definitely lick their fingers. An incredible kurma, goes awesome as a prefect gravy with rice,rotis,idlis,dosas and even with toasted bread slices. If you want to skip coconut,cashews in your kurma,give a try to this kurma. I want to call this kurma absolutely as diet kurma as its suits prefectly for non vegetarian dieting people too. Marinate the chicken pieces with lemon juice,turmeric powder and coriander powder with enough salt atleast for 2hours and keep aside. Grind all the ingredients from the list to grind as fine thick paste and keep aside. Heat the oil and fry the whole spices until they turns brown, add immediately the chopped onions, chopped tomatoes, ginger-garlic paste,slit opened green chillies and saute everything until the raw smell goes away..
Add now the marinated chicken pieces to the veggies,cook everything for 5minutes. Now add the grounded paste and cook everything in simmer for few minutes. Add enough water and cook everything until the chicken pieces get well cooked. Finally add the mint leaves and put off the stove. Hope you guys had a wonderful xmas party,mine went absolutely fabulous and i was too excited to get almost every gift i wished to get, yep my Santa was simply awesome.Coming to this cake,this recipe was shared with us by Gayathri of Gayathri's Cook Spot for her Eggless baking group as am a part of this incredible homebakers. We prepared this cake as eggless cake and post for the month of October here. This time i tried again as a butter semolina cake with eggs coz my daughter loved the eggless version very much. This cake have raisins in it,this time i completely skipped it even my lil one who hates raisins enjoyed thoroughly this cake. 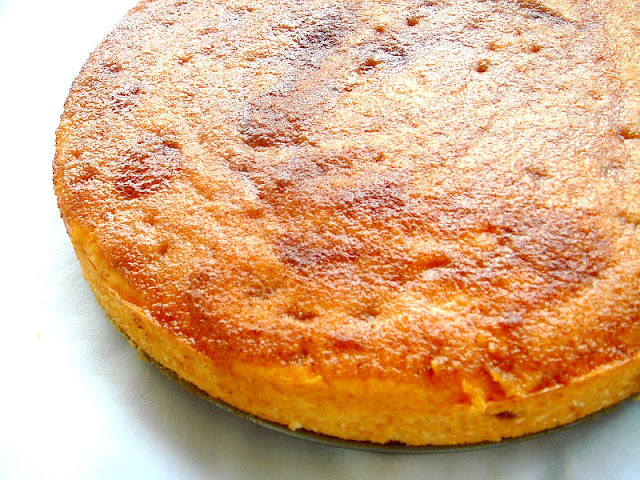 This super spongy cake goes for a flavourful topping mixture prepared with cinnamon powder,sugar and butter and this gives a wonderful aroma to the cake. Seriously this cake was bit airy and super spongy, an excellent dessert to serve with a spoon of caramel sauce and we had it for a xmas party dessert. Everyone enjoyed thoroughly each and every bite of this cake. This is my last post for this year's blogging marathon.Check out the other bloggers running this 23rd edition of blogging marathon here.Do check Champa, Srivalli, Sumana Deepak,Veena,Jayasri and Preeti Deo wat they baked for the 12th day of bake-a-thon.Sending to Show Me Your HITS-Festive Foods guest hosted by Roshni,event by Sangeetha. Beat together the butter and sugar until they turns creamy, add the egg one by one to this mixture and beat for few minutes. Now fold in the flour,semolina and vanilla essence to the butter mixture gently with a spatula, stir in the milk. Serve warm with a caramel sauce or with a cup of tea. My kids love kiwis, they just have them every morning with their bowl of milk especially during winter morning just to boost them as these fruits are rich in vitamin C than the orange. Last week, my H came back home with a bag of kiwi for them,but unfortunately those kiwis were tasteless and none at home touched it. Instead of trashing them, with a store bought puff pastry sheet i finished those tasteless kiwis as upside down pie with a simple sugar syrup.Needless to say that this pie gets vanished quickly, an excellent dessert to enjoy with some whipped cream after lunch or dinner. Since i used puff pastry sheet for making this pie, this pie gets ready very much quickly. You can go for usual pastry dough, but store bought puff pastry makes the life easier.You can replace kiwi with your favourite fruits and this pie is definitely a best way to sneak the fruits if your kids hates them to the core.As i choosed kid's delight-desserts as this week's blogging marathon theme, am posting this pie for my second day of blogging marathon. 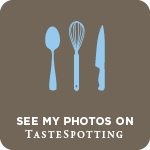 Check out the other bloggers running this 23rd edition of blogging marathon here.Sending to Show Me Your HITS-Festive Foods guest hosted by Roshni,event by Sangeetha. Heat the butter, fry the sliced kiwi for a minute in both the side and keep aside. Heat the sugar with 2tbsp of water to make a sugar syrup. 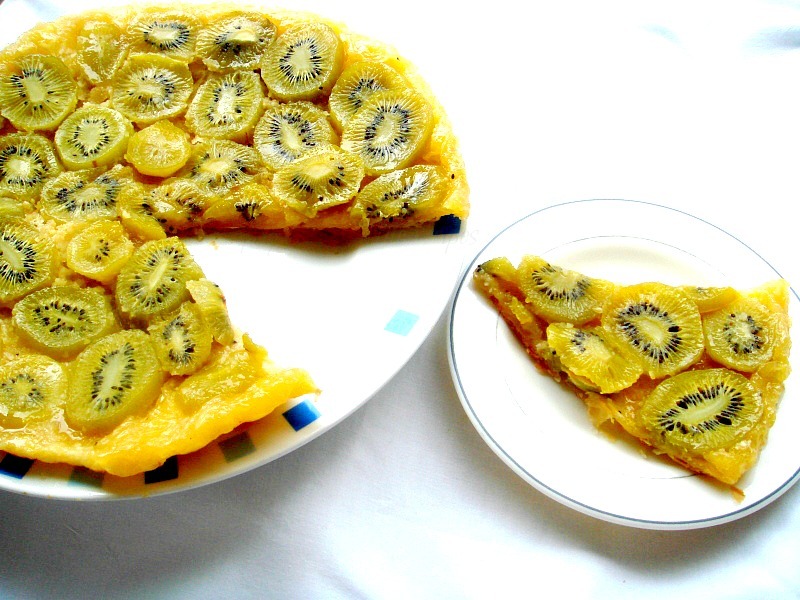 Pour this sugar syrup to a pie pan, place the already fried kiwi slices side by side over the sugar syrup. Cover them with a puff pastry sheet, press it well to cover the fruits completely. Bake for 15-20minutes until the crust turns golden brown. Keep aside and let the pie gets completely cool. Gently invert the pie to a plate, take care while inverting. Slice it and enjoy with whipped cream. Kids are in vacation, obviously am bit busy with them.Even my oven is quite busy now, we are in baking mood. Two days back, my lil one asked me to bake a cake with jam, i know he was asking to make a roulade aka swiss roll, he helped me and we baked the simple vanilla roll with green and rose food colour as something christmassy. This roll is really very quite easy to prepare and you can also prepare them with your favourite flavour or favourite spread eventhough my choice went for strawberry jam. You can serve this super spongy swiss roll as dessert with a scoop of icecream or with a simple chocolate sauce. My theme for this week's blogging marathon theme is kid's delight-desserts, obviously swiss roll can be served very well for dessert with an icecream or with a sauce. If you dont like adding the food colour, just skip them. Check out the other bloggers running this 23rd edition of blogging marathon here.Do check Champa, Srivalli, Sumana Deepak,Veena,Jayasri and Preeti Deo wat they baked for the 11th day of bake-a-thon.Sending to Show Me Your HITS-Festive Foods guest hosted by Roshni,event by Sangeetha. Separate the eggs whites and egg yolks.Sieve together the flours,baking powder and keep aside. Beat the egg yolks and sugar in a bowl until they turns smooth and pale yellow creamy mixture, add slowly the sieved flours,vanilla essence and mix everything well. Meannwhile beat the egg whites separately with a pinch of salt until stiff peaks form, gently fold the egg whites to the already prepared flour mixture and mix everything well. Divide the batter into three equal parts and take them in a bowl, colour one with rose food colour while the another with green colour. Pour the batter side by side in a 10x15inch jelly roll pan lined with greased baking paper..
With a tooth pick, make some swirls in the batter and bake for 15minutes and immediately roll the baked cake in a slightly wet towel and let it get cool. Spread generously the strawberry jam and roll it tightly, cover the roll with a cling wrap and let it sit for an hour in fridge. Dust generously with the confectioner's sugar. Cooking specially and doing a guest post for a co-blogger is definitely an interesting part of this virtual world, few days back i got a message from Arthy of Sumanarthy's Kitchen asking whether i can do a guest post for her. Her message made me happy and immediately i said ok for making a guest post for her.I visit her space almost everyday since few months and love her variety of droolworthy foods particularly her malay foods, i have bookmarked few to try especially her prawn sambal, as i love sea foods very much. Coming to the guest post,she said she want something prefect for this festive season,i know i'll be making a fruit cake for her and finally decided to make a vegan version.Thanks to Arthy for giving me a wonderful chance to make this guest post.This vegan cake goes for both whole wheat flour and all purpose flour with loads of nuts and dry fruits with avocado puree and flaxseed powder as egg subsitute, for my surprise this cake was extremely moist,spongy and definitely healthy. Definitely this cake will satisfy anyone's tastebuds and none will miss the eggs in this cake. Grease a round cake pan with oil and line a baking sheet. Sieve the flours with baking powder and baking soda and keep aside. Mix the flaxseed powder in three tablespoons of warm water and keep aside. In a pan, heat the dry fruits,sugar,honey,water in low flame until the sugar gets dissolves, then put the flame in high and bring it to boil. Put the flame again in low and cook for half an hour,so that the dry fruits will gets well cooked, put off the stove and add the 1/2tsp of baking soda,mix it and keep it aside. In a bowl, take together the avocado puree,oil,flaxseed mixture,vanilla essence and spice powders and mix, now add the cooked fruit mixture,orange zest and nuts,mix everything well. Add the flours to this mixture and mix gently with a spatula. Transfer this cake batter to the already prepared cake pan and bake cake for an hour or until a skewer inserted comes out clean. Let the cake gets cool completely . Dust with confectioner's sugar and enjoy. My paternal grandma usually add white vinegar in her chicken thokku and i just love her version of mildly vinegared chicken thokku. This thokku served with hot piping rasam will definitely satisfy your tastebuds and a real feast for chicken lovers like me. I prepared this fingerlicking chicken thokku last weekend and went adding a simple spice powder prepared with flax seeds and finished the cooking with balsamic vinegar. This thokku turned out exactly as like my grandma's chicken thokku. We had it with rice for lunch and finished the remaining thokku for dinner with chappathis. If you dont have flax seeds and balsamic vinegar, you can completely skip them and go for usual spices and white vinegar. Marinate the chicken with chilly powder,turmeric powder and lemon juice for half an hour. In a pan, heat enough oil and fry the whole spices..Add immediately the chopped onions,ginger garlic paste and cook until the raw smell goes away. Add the marinated chicken to the cooking veggies and cook for few minutes. Meanwhile dry roast all the spices given under the list and grind as fine powder. Cook the chicken in simmer, until they get half cooked. Now add enough freshly grounded spice powder, balsamic vinegar and cook everything again for few more minutes in medium flame until the oil gets separates from the chicken thokku. Add the coriander leaves and put off the stove. Serve hot! Brioche is one of our favourite bread, everyone at home love to enjoy brioche for their breakfast with strawberry jam or simply with nutella. This time when i planned to make some brioche, i want to make them different from the usual one. I simply googled and finally i landed to a french blog, seriously i got hooked to this brioche bouclettes here,i love this curled brioche and prepared them last weekend for our sunday's brunch. This brioche turned out simply fabulous, as this brioche goes for a syrup with butter,sugar and honey you dont even need any spread to while having them. 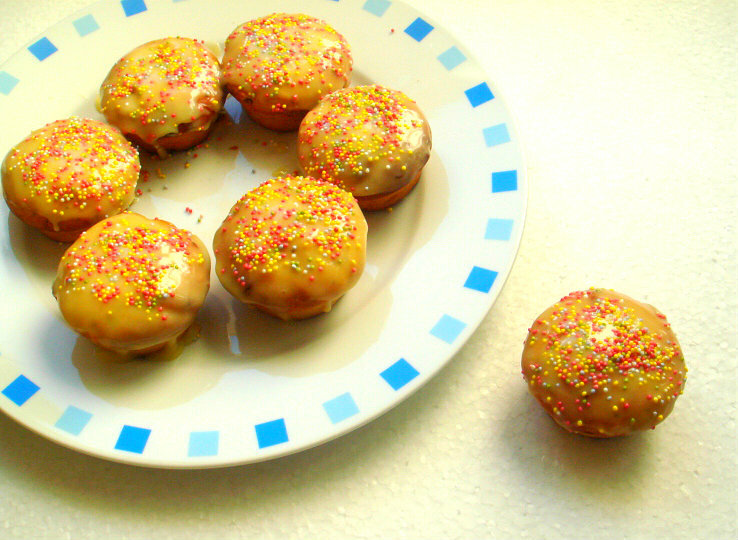 Even though mine is not prefectly rolled as like the original recipe,tastewise they were simply prefect. Next time if you want to make some brioche,do give a try friends. Am damn sure that everyone at home will truly enjoy this addictive brioche.Do check Champa, Srivalli, Sumana Deepak,Veena,Jayasri and Preeti Deo wat they baked for the 10th day of bake-a-thon. Knead the dough again for few minutes, divide the dough as two equal balls. Roll the dough as a large disc, with a round cookie cutter cut the rolled dough as small circles. Continue the process until the dough gets finished. Take three small circles and arrange them side by side, roll them to form a curled rolls. Arrange one by one in a greased round baking pan and keep again for half an hour until they double their volume. Mix the melted butter,sugar and honey in a bowl, pour this syrup over the doubled dough.Sprinkle the black poppy seeds on the top. Bake for 20-25minutes until the crust turns brown. Let it cool completely and enjoy. Rasam is one of my comforting food, but after that i can enjoy a simple vegetable kootu just with a bowl of rice and spicy lemon pickle. I dont need an elaborate meal,just a kootu with channadal is quite enough to satisfy my tastebuds.While checking my recipe index, i couldnt able to see my cabbage kootu i usually prepare with channadal, this time when i prepared this simple, easy breezy cabbage kootu for our yesterday's lunch i immediately clicked it to post today. This fingerlicking kootu goes awesome even with chappathis or else with rice.Sending this simple,easy kootu to my own event CWS-Channadal. Pressure cook channadal with turmeric powder with enough water for 3 hisses and put off the stove. Heat oil, add the mustard seeds,urad dal,cumin seeds,dry red chillies and fry, once they turns brown add the asafoetida powder and curry leaves. Now add the chopped ginger,chopped cabbage and saute everything for few minutes until the cabbage shrinks a bit. Finally add the cooked dal and bring to boil. Cook in simmer until the veggies get well cooked. Put off the stove and serve hot with rice. Christmas is nearing and hope many will be busy in shopping,preparing gifts and wrapping them.We are getting ready with our xmas dinner list and my dinner table is going to be filled with variety of wonderful foods as like last year. Kids are waiting eagerly for the xmas vacation,still three more days to go,even am waiting eagerly to bake some more christmas cookies and cakes with my kids.As i told earlier,my theme for this week's blogging marathon is christmas special, needless to say that my third post is going to be a christmas fruit cake without eggs. Two days back, i tried this eggless christmas fruit cake from Sharmi's Passions, this cake goes for mashed potatoes and its completely alcohol free. If you want to give a try to eggless fruit cake,this cake is for you. Actually christmas fruit cake always goes for atleast 4-5eggs,but you wont miss eggs in this cake. This cake is very much rich in fruits and nuts, they doesnt need pre-soaking. You can make them quickly,easily and am sure that this cake will definitely satisfy your cravings for rich fruit cakes.I just made few changes according to my family's tastebuds and increased the quantity of dry fruits in this cake. Check out the other bloggers running this 23rd edition of blogging marathon here.Sending this fantastic eggless fruit cake to Tried & Tasted-Sharmi's Passions hosted by me,event by Lakshmi.Do check Champa, Srivalli, Sumana Deepak,Veena,Jayasri and Preeti Deo wat they baked for the 9th day of bake-a-thon. Grease a round cake pan with enough butter and line a baking sheet. Sieve the flour with baking powder and baking soda and keep aside. In a pan, heat the dry fruits,sugar,butter,honey,water in low flame until the sugar gets dissolves, then put the flame in high and bring it to boil. In a bowl, take together the yogurt,vanilla essence and spice powders and mix, now add the cooked fruit mixture,mashed potato,orange zest and nuts,mix everything well. Add the flour to this mixture and mix gently with a spatula. Transfer this cake batter to the already prepared cake pan, place gently few cashew nuts on the top and bake cake for an hour or until a skewer inserted comes out clean. As per original recipe, the batter will be thick,but i prepared mine not much thick as i dont want my kids to notice the dry fruits chunks in the cake. If you want to make the batter thick,just reduce the quantity of yogurt as half cup. Chop the nuts and dry fruits too small so that they will blend well with the cake. Dont cut the cake while its hot or warm, they will get crumble. Let the cake cools for atleast 5 hours or else even overnite before slicing. Yule log cake aka Buche de Noël, christmas without yule log cake i cant even imagine it. We get every year store bought yule log cake from our nearby bakery, last year i tried my hands with a simple chocolate yule log cake as everyone enjoyed thoroughly, i decided that day not to buy anymore this festive cake.As i chosed christmas special as theme for this week's blogging marathon, i prepared an another yule log cake with vanilla and coffee mascarpone frosting. This yule log cake was a big hit at home,with a mild coffee flavour this vanilla log cake is definitely a prefect cake for the celebration and this recipe is a keeper for me.Am planning to make the same yule log cake with a different frosting for our christmas dinner, as everyone at home asked me to make some again.May be i'll go for a caramel based frosting or a dark chocolate ganache with the same vanilla sponge cake or else with a chocolate sponge. Beat the egg yolks and sugar in a bowl until they turns smooth and pale yellow creamy mixture, add slowly the sieved flours and mix everything well. Pour the mixture in a tray lined with greased baking paper..bake for 15minutes and immediately roll the baked cake in a slightly wet towel and let it get cool. In an another bowl,beat the mascarpone cheese,coffee powder and confectioners sugar until everything get well mixed. Gently fold the cream to the cheese mixture and mix well. Keep in fridge for atleast an hour before starting the frosting. Once the cake roll get cooled,with a spatula spread the coffee mascarpone frosting over the cake roll. Roll again well and spread well the remaining frosting over the rolled cake roll. With a fork make some lines over the frosting and arrange in fridge for two or three hours. I springled few chocolate curls over the roll before arranging in fridge. Am starting again my three days of blogging marathon today, my theme for this week is Christmas special. Christmas, love this festival and we never failed to celebrate it every year with loads of foods,chocolates and gifts.I cant imagine my christmas dinner table without a bread obviously my first recipe goes for a celebration bread. Challah bread is a celebration bread in Jewish tradition, this bread goes for a rich dough with a mild sweet. Challah bread sounds almost like brioche bread, eggs are added to enrich the dough and milk or butter is not used in this bread dough as this bread may be eaten with meat.This bread goes for a fabulous texture,excellent flavour and beautiful braid. Nothing will beat the smell of the freshly baked challah,you can go for three,four and six braids for making this challah bread. Mine is a 4 braided challah bread, thanks to youtube, i simply went through this video to make easily my 4 braids.I really enjoyed making this challah bread and my kids loved it with nutella spread.You can easily finish up this challah bread as french toast to whip up on christmas morning if you have served this challah bread with meats for a christmas evening.Do check Champa, Srivalli, Sumana Deepak,Veena,Jayasri and Preeti Deo wat they baked for the 8th day of bake-a-thon. Also check out the other bloggers running this 23rd edition of blogging marathon here.Sending to 60days of Christmas hosted by Priya and Divya. In a lare bowl, combine the eggs,egg yolk,oil and water, stir well. Mix in the flour,yeast,sugar,salt and knead everything together to form a stiff dough,knead well for few more minutes until the dough turns soft and smooth dough. Transfer the dough to a greased large bowl and cover it with plastic wrap,let it sit in a warm place until its doubled in size for about 2hours.Gently press down the dough,reflate it and cover it again, let it sit again for about an another hour. Take the dough in a lightly floured surdace, divide into two large balls and again divide each balls into two more medium balls again. Roll each balls as a long rope,line them side by side, pinch the pieces together at one end and start braiding. Transfer it to the baking sheet lined over a baking tray, let it sit again in a warm place for half an hour. Meanwhile mix the egg yolk and water for egg wash.Preheat the oven to 350F. 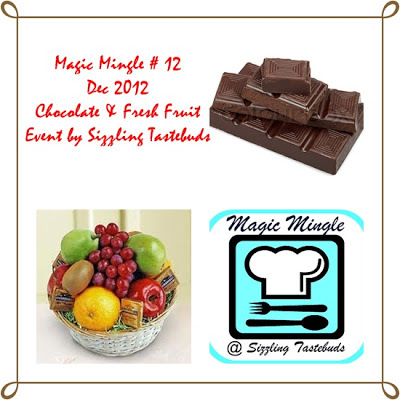 Brush generously the rised braided bread with the egg wash,springle the sugar pearls generously. Bake the bread for 30-35minutes or until the crust turns golden bread. Kodubale, the famous ring murukku this is how we call it. Kodubale is our this month's Indian Cooking Challenge and Valli shared two recipes of this kodubale, one is from Suma's space and the another one from Latha's space. I chosed Lathamma's recipe coz of peanuts, as i ran out of them i couldnt able to do Suma's version. I'll making her version soon as everyone at home enjoyed munching these cuties.Coming to this kodubale, this is a quite famous snacks in Karnataka eventhough Andhralites shared almost a same murukkus called chegodilu, we have already tried for Indian cooking challenge and you can see them here. While am rolling the dough, my lil one was very curious and helped me to roll some, he just loved it and very much proud of rolling these kodubale. He couldnt stop himself calling his grandparents saying that he rolled perfectly these ring murukkus.Yep kids will definitely have fun and those lil hands will help you very much while making this murukkus. Dont forget to ask them to help you, that too if you are preparing kodubale in huge quantity.With a wonderful coconut flavour and crispiness, these kodubale are quite addictive. Dry roast the dessicated coconut and grind as fine powder. Also dry roast both the all purpose flour and wheat flour in simmer until they turns slightly golden brown. Now take the flours, coconut powder, asafoetida powder,ghee,salt and chilly powder in a large bowl. Gradually add the water and turn as a soft dough. Take a small ball from the dough and roll as a log. Join both the ends to form a ring.Continue the same process until the dough gets finished. Heat the oil for frying in medium flame,dont put the flame in high. Gently drop the rolled kodubale to the oil, fry them in small batches until the kodubale gets well fried. Drain the excess of oil with a paper towel and store in an air tightened box. Enjoy with a cup of masala tea. 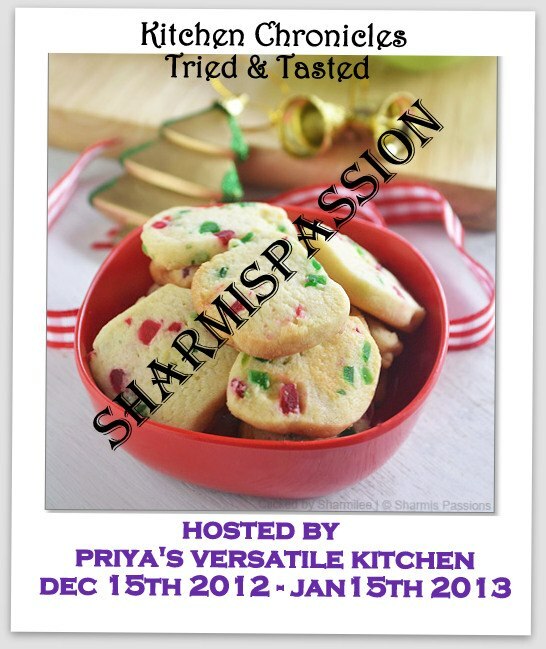 Am honoured and happy to annouce that am hosting Tried & Tasted for this month of december, an event started by Zlamushka, which was taken over by Lakshmi of Kitchen Chronicles.Its a great pleasure to say that i have choosed a wonderful,super blogger Sharmi of Sharmis Passions as this month's T&T blog for this event..The motto of this event is to try and taste the dishes from our fellow bloggers by re-creating them in our kitchen. Coming to Sharmi's space, most of us would have crossed her blog atleast once a while in this blogsphere since her space have many beautiful,healthy,nutritious, traditional,egg free dishes and her speciality is her step by stepwise pictures, even a novice cook or a novice baker never goes wrong with her recipes..You can see many traditional dishes to many bakes at Sharmi's beautiful space, i love her bakes and now we have no excuse to try and taste many beautiful dishes from her space. So friends, do try any dishes from her space and send it to me anytime before 15th January 2013.You have few rules to follow, just go on through them before sending your entries to me..I'll be adding soon the logo as Lakshmi is actually creating the logo for this month's T&T event, a special thanks to her for creating the logo. 1)Cook any recipe(s) from Sharmi's Sharmis Passions and post about it. Stay as true to the original recipe(s) as possible. Therefore, there is no need for re-posting it, simply link to the original post..
5)Dont forget to link your entries in the linky tool below. 6)Deadline is the 15th January and the round up will be posted within a week. Do cook more from Sharmi's space and enjoy sending me all your beautiful entries before 15th January 2013. 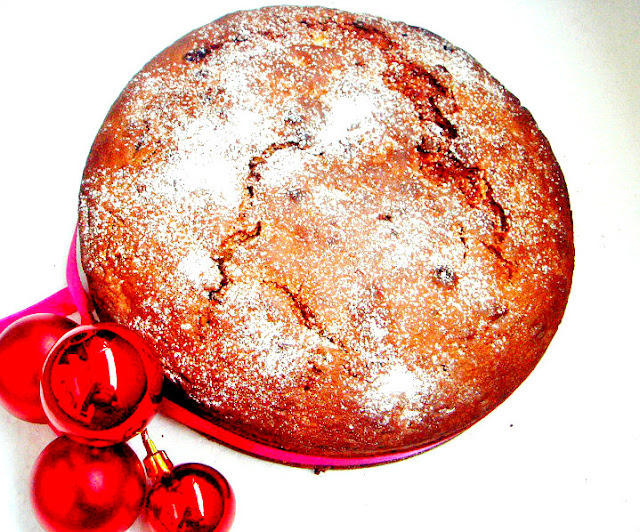 Christmas without plum cake is just like christmas without santa. Yep i cant imagine my christmas celebration without this cake loaded with dry fruits and nuts. Usually i'll soak the dry fruits in rum before a month for making my christmas plum cake but this time when we received this month's Baking partners mail with three different festive cakes, i know i'll be baking this plum cake suggested by Archana of Tangy Minds. I prepared this cake last weekend to take them to my mom's place as my dad just love this cake very much.We just enjoyed each and every bite and this cake turned out absolutely awesome with a beautiful texture.I didnt changed anything apart from the candied orange peels from the original recipe given by Archana,i simply replaced them with fresh orange zest and tutti frutti chunks else i followed each and every step as per the recipe went for. Nowadays this Baking Partners group is very close to my heart, eventhough we are just passionate home bakers i just love the friendship chain behind this group. If someone have a doubt, definitely there will be an another one to help and share the tips and tricks.Obviously am learning so many tips from them, thanks to Swathi of Zesty South Indian Kitchen, the brain child of this fabulous baking event, for bringing us together and making this wonderful event very interesting every month. In a small pan, take the sugar,water and lemon juice given for caramel syrup and swirl pan to mix. Heat in medium flame until the sugar turns brown and caramelized, add immediately the boiling water and swirl the pan to mix well,keep aside. In a pan, add the rum,dates,raisins,orange zest, tutti frutti chunks and cook everything in medium flame. Finally add the cashews and cook again for a minutes,put off the stove and keep aside. Beat together the butter and sugar in a bowl until they turns creamy, add one egg yolk at a time and blend well. Add the vanilla extract and beat well, gradually add the flour little by little and blend well. Add the caramelized sugar syrup to the mixing bowl and blend, finally add the fruit and nut mixture to the mixing bowl and gently mix it with a spoon. Beat the egg whites in an another bowl with a pinch of salt until they turns fluffy and a soft peaks form. Fold gently the egg whites to the cake batter. Pour this cake batter to the greased baking pan and bake for 45-50 minutes or a skewer inserted comes out clean. Remove the cake from the oven and allow it to cool completely. Ghee biscuits aka nei biscuits, these biscuits are quite famous in India,with a wonderful ghee flavour. While having these biscuits will just melt in mouth. 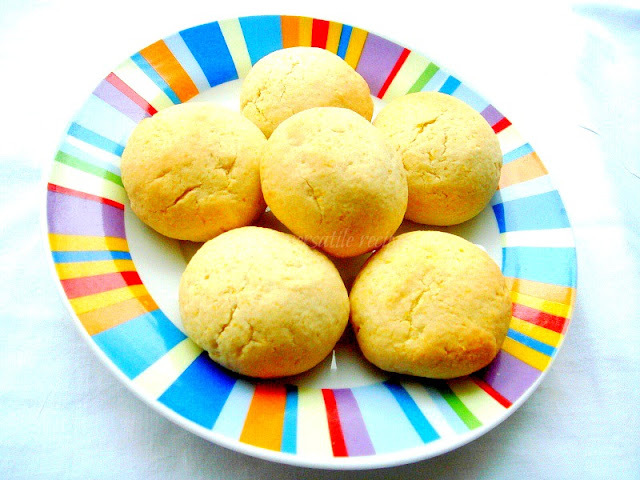 Usually these biscuits are prepared with maida but for a change i tried adding cornmeal. The addition of cornmeal gives a wonderful texture to this biscuits and we couldnt stop ourselves munching this addictive biscuits. These biscuits are very much compared to the shortbread cookies, ghee is clarified butter and this famous ghee is often used in Indian cooking. Ghee biscuits are my favourite biscuits and my uncle never forget to get them from the nearby town whenever we go to our grandma's village.Coming to this biscuits, this biscuits is completely prepared with ghee, if you are health nut you can reduce the quantity of ghee and go for milk. But somehow i love to prepare this biscuits completely with ghee.Do check Champa, Srivalli, Sumana,Veena,Jayasri and Preeti Deo wat they baked for the seventh day of bake-a-thon.Sending to 60days of Christmas hosted by Priya and Divya. Preheat the oven to 325F, line a baking sheet over a baking tray. Mix the ghee and icing sugar in a bowl,beat well until it turns creamy. Now add the all purpose flour,grounded cornmeal and baking powder, mix well and knead as a soft dough. Make medium sized balls from the dough,flatten them slightly and place over the baking sheet lined over a baking tray. Bake for 15-20minutes,dont let the biscuits turns brown. Biscuits will be soft and smooth while its hot,do let them cool completely and arrange them in an air-tightened box. Beware,these biscuits are quite addictive. 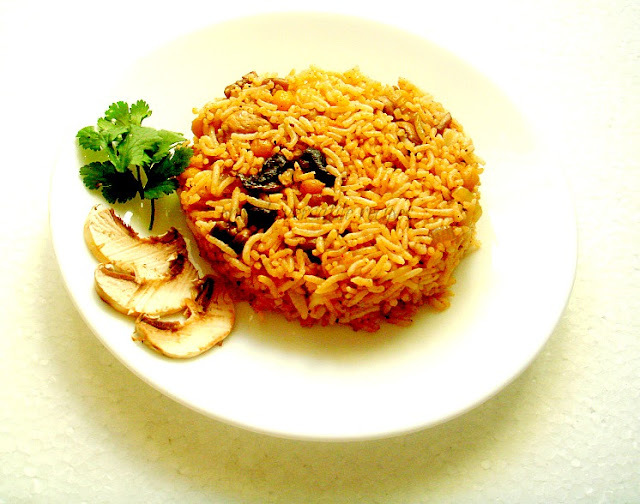 Tawa pulao is one of the famous street food of Mumbai and this dish is usually cooked in the same tawa,in which pav bhaji masala is made usually. These tawa pulao is sold on Mumbai streets in almost each and every corners,junctions or roads of mumbai. People have craze to eat tawa pulao in mumbai and this dish is cooked quickly with a medley of veggies tossed with Indian spices and rice. For a change, i prepared this tawa pulao with already cooked channadal and mushroom, a wonderful combo and this rice tastes simply awesome. Bachelors this recipe is specially for all of you guys, just mix and match the veggies as you desire and your tawa pulao is ready to enjoy.Serve with some raita or papad, am sure this dish will definitely satisfy your tastebuds and a prefect lunch box menu too.Sending this beautiful tawa pulao to my own event CWS-Channadal and to 60days of Christmas hosted by Priya and Divya. Heat enough oil, fry the cumin seeds until they turns brown, add immediately the chopped onions,saute until the onions turns transculent. Add the ginger garlic paste to the veggies, cook until the raw smell goes on. Add the cooked channadal,chopped mushrooms, pav bhaji masala,garam masala powder and salt, saute for few minutes, add some water and cook until the water gets evaporated. Serve with fried potatoes or eggs. Mini crescent dinner rolls have a soft,buttery and super fluffy texture than a flaky croissant, this dinner rolls are really easy to split and enjoy with your favourite spreads. Also these dinner rolls goes awesome with a meats, hot warm soups or creamy gravies when served during a dinner. They stay simply prefect for more than a two days if they are conserved in an air tight container.Obviously these cute rolls are very addictive and half of my dinner rolls get vanished quickly once they came out of the oven. 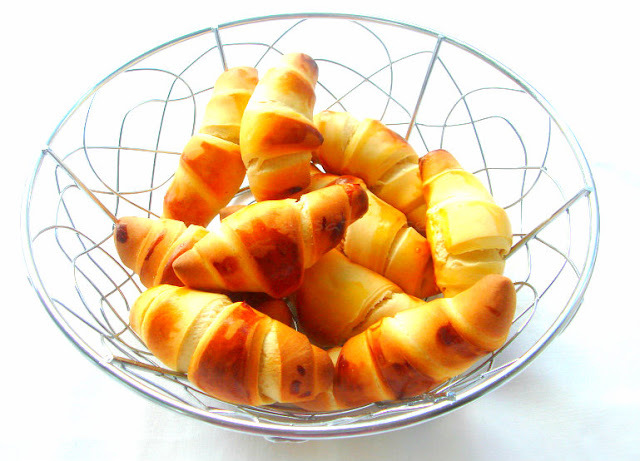 Shaping a crescent rolls is very much easier than you may think, just make a bread dough and roll them as a big circle, then using a knife divide them as triangles/wedges, start it from the edge and roll each slice towards the center to form these crescent rolls,thats all. I brushed my rolls with egg yolks,you can also brush them with melted butter to make them more buttery. In a bowl, dissolve the yeast with warm milk,sugar and let it stand for 5minutes until the yeast turns foamy. Now take the butter,sugar,egg yolks in a bowl and beat it, add in the flour and foamy yeast and knead as a stiff dough. Dust the dough and knead for 8-10minutes until the dough turns soft and elastic.Place the dough in a greased bowl and cover it. Let it rise in a warm place until the dough gets doubled about 2 hours. Punch down and divide the dough as two equal balls.Roll each dough balls as circle, cut each circle into 10 mini sized wedges. Now roll up the wedges from the wide end towards the center and arrange them over the baking sheets lined over a baking tray. Cover it again and let it rise in a warm place for half an hour. Preheat the oven to 350F, beat the egg yolk for brushing with 2tablespoons of water and brush the rolled crescent rolls. Bake for 15-20minutes or until the crust turns golden brown. Serve or enjoy with your favourite spread or soup. My third post for this week's blogging marathon with zero oil cooking as theme is these healthy,protein packed steamed mixed dals masala vadas. Eventhough i have posted already baked and deep fried crispy masala vadas, these steamed vadas was my recent favourite, eventhough none at home enjoyed it. These masala vadas served with a spicy chutney or a simple chilly sauce tastes simply fabulous. 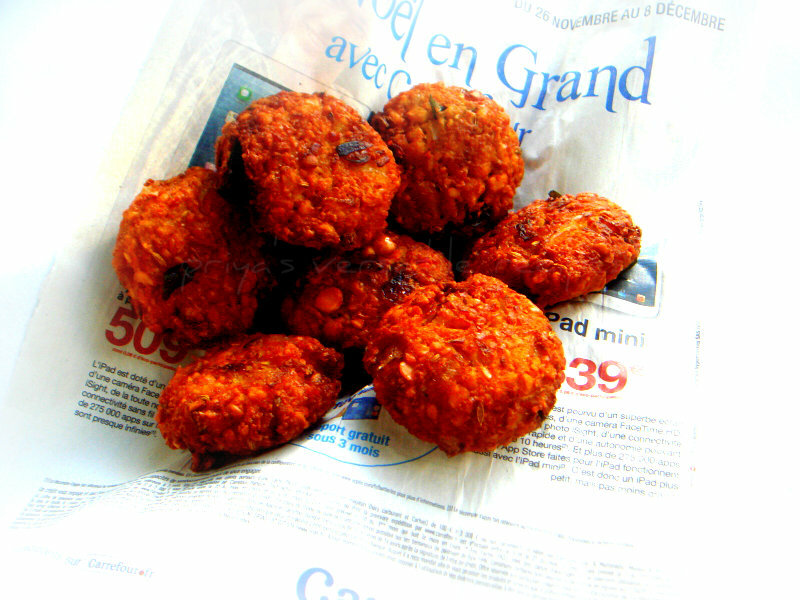 Again this vadas are oil free and dont even have a single drop of oil. I used parchment paper while steam cooking these vadas as they tends to stick to the vessel.Seriously parchement paper helped me a lot obviously i didnt even greased my idly plates i used for steaming these vadas.If you have any leftover of these steamed vadas, you can even serve them with a spiced buttermilk as dahi vadas or you can add them very well in spiced gravies like kuzhambu,rasam or in kurmas.Check out the other bloggers running this 23rd edition of blogging marathon here.Sending these vadas to my own event CWS-Channadal and to 60days of Christmas hosted by Priya and Divya. Drain the excess of the water from the dals and grind the dals coarsely without adding water, if its too hard to grind just springle few drops of water. Now add the chopped onions, chopped green chillies, ginger pieces, chopped curry leaves, coriander leaves, crushed fennel seeds with enough salt to the grounded batter and mix everything well. Make small balls from the vada batter and flatten them. 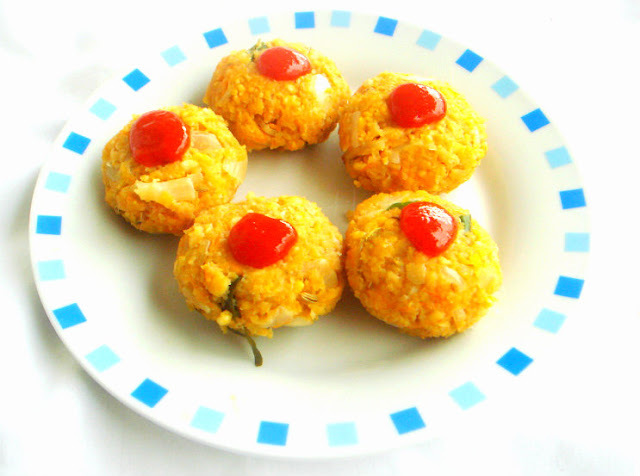 Arrange the flattened vadas over the idly plates lined with parchement paper. 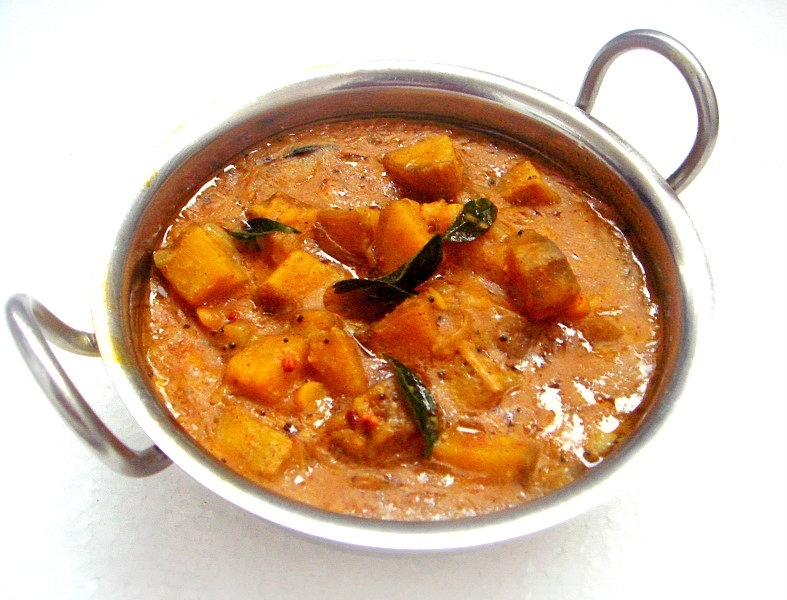 Steam cook them for 10-15minutes in an idly cooker and enjoy warm with ketchup or chutneys. After some guilt free zero oil potato chips,my next recipe for this week's theme of zero oil cooking goes obviously for the most famous Indian snack the popular deep fried samosas. Since i have already prepared samosas as baked version and shallow fry version, i seriously wanted to give a try to the steamed ones. 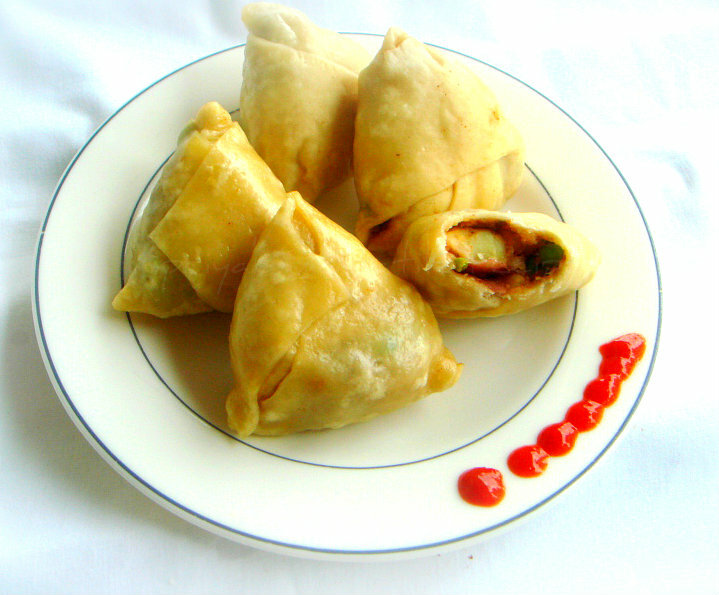 If you guys love the famous momos, the Tibetan steamed dumplings, this steamed samosas is for you. Even the filling in this samosas dont have a single drop of oil and these steamed version samosas will be a big hit if you give a try to them. Initially even i wasnt very much sure of the final result and went for small quantity of dough and stuffing,finally they turned out simply awesome and these steamed samosas is our recent favourite snacks, serve it simply with a hot chilly sauce or ketchup am sure you guys will definitely fallen in love with this steamed zero oil potato samosas. Check out the other bloggers running this 23rd edition of blogging marathon here.Sending to 60days of Christmas hosted by Priya and Divya. Sieve the flour,baking powder together and knead with enough water as a smooth and soft dough, cover the dough with a damp cloth for half an hour and keep aside. Take the mashed potatoes,chopped green chilly,garam masala powder, chaat masala,salt and chopped coriander leaves in a bowl, mix well. 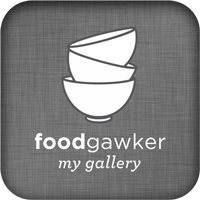 Make tiny balls from the dough, dust with flour and roll them as circles, cut in the middle of the circles, make two demi circles, just fold the sides to make a cone. Now gently put some already potato mixture inside the cone, press the sides tightly until they gets sticks or use water to stick the edges,continue the process until the masala and dough get finished. Steam cook them for 10-15minutes in an idly cooker and enjoy warm with hot sauces or ketchup. Hardly peoples say no to potato chips, if you want to give a try to zero oil,guilt free potato chips this is for you. Yep even am not sure about making these chips until i choosed the theme zero oil cooking for this week's blogging marathon. So for the next two days i'll be posting dishes with zero oil cooking.When i choosed zero oil cooking as theme, i know i'll be making potato chips but not through microwave oven as i have already tried them and obviously i wanted them as baked ones. 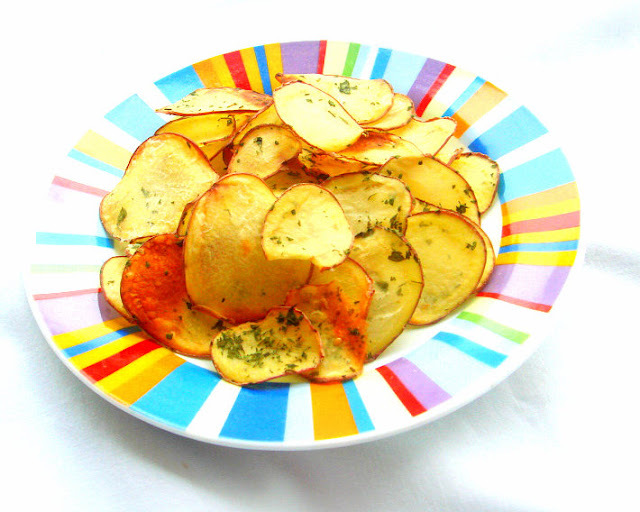 Until i saw the final result of these crispy and guilt free potato chips i wasnt sure of this baked version. For my surprise they turned out simply awesome, if you are searching for prefect chips as like deep fried ones, sorry they dont tasted as though , but i wasnt disappointed of this zero oil baked potato chips. Once a while,i'll be making these chips as i loved them munching. Do check Champa, Srivalli, Sumana Deepak,Veena,Jayasri and Preeti Deo wat they baked for the fifth day of bake-a-thon. Also check out the other bloggers running this 23rd edition of blogging marathon here. Peel and slice the potatoes as thin chips with a mandolin. Preheat the oven to 175F, line a baking sheet and arrange a single layer of sliced potatoes, sprinkle the salt and herb as per need, bake for an hour until the chips turns super crispy..
After potatoes, raw bananas are one of my favourite veggies, i never failed to get them from Indian groceries even sometimes its really very hard to get super fresh raw bananas. My last trip to Indian groceries was simply awesome, i brought back home super fresh veggies especially raw bananas and immediately cooked one of my favourite kootu with this veggies. When the weather is too chilled and if you feel like having something comforting, this rawa banana kootu will definitely satsify your tastebuds. 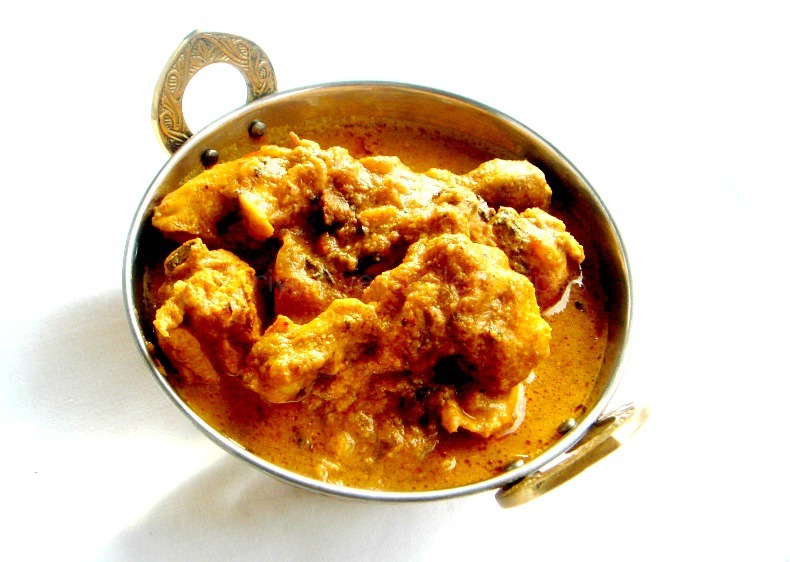 This tangy gravy goes awesome with rice and fried papads, i can survive for many days with this fingerlicking gravy. They tastes even more better after a day and this gravy goes for lentils,raw banana and spices.This gravy is usually made either with toor dal or channa dal but my choice is channadal here. This kootu goes grated coconut while tempering which gives a wonderful flavour to this dish. Since this gravy will turn thick, you can serve them very well as side dish to curd rice. Sending this gravy to my own event CWS-Channadal. Pressure cook the channadal with enough water and keep aside. Cook the cubed raw banana pieces with sambhar powde,turmeric powder and salt with enough water. Meanwhile extract the tamarind juice from the tamarind piece. Add this tamarind extract,cooked and mashed channa dal to the cooked raw banana pieces,cook everything in simmer until the gravy turns thick. Lets splutters the mustard seeds,urad dal,channadal,hing,add the grated coconut and curry leaves,fry until they turns brown. Add this tempered spiced to the kootu and bring it to boil. Serve hot with rice or as side dish with curd rice. 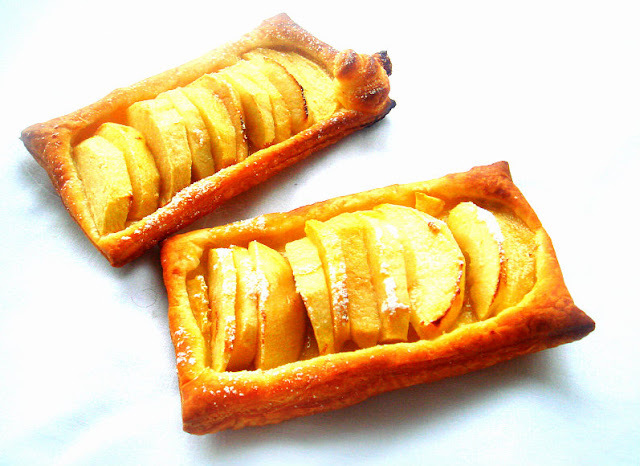 If you have apples sitting sadly in your fruit basket and you dont know wat to make with them, these fast,easy and super tasty pastry is for you. If you choose the already prepared store bought puff pastry sheets, this wonderful looking apple pastry gets ready in a jiffy. An incredible and a very quickest pastry i have ever made, everyone at home will definitely enjoy thoroughly this beautiful pastry when served with their favourite drink. Personally my freezer will always have frozen puff pastry sheets and i know that if i feel down i'll be baking something with them just to get rid of my mood. With sliced apples,brown sugar and cinnamon powder, these apple pastry tastes simply awesome,mildly flavourful and very attractive. If you make these pastries at home, am sure you will make them quite often as they are simply addictive. Do check Champa, Srivalli, Sumana Deepak,Veena,Jayasri and Preeti Deo wat they baked for our fourth day of bake-a-thon.Sending to 60days of Christmas hosted by Priya and Divya and to Jaleela's Bachelor's Feast. Add the sugar,cinnamon powder to the sliced apples,mix and keep aside. Meanwhile, cut the puff pastry as six numbers of small rectangles. Place the slices on the pastry pieces in the middle and leave the sides free. Arrange this apple layered pastry sheets over a baking sheet and bake for 15-20minutes until the crust turns brown. While serving,dust the icing sugar over the pastry and serve. If its chilled outside,obviously my mind will goes definitely for something deepfried for snacks. Eventhough am keep myself away from deepfried fritters, once in a while i dont hesitate a second to make some masala vadas as my kids started asking vadas for their snacks. Our recent favourite crispy fritters are these oats masala vadas,they are truly addictive and we couldnt stop ourselves munching these fritters. Soak the channadal for atleast two hours, drain the water and grind them as coarse paste without water, if its too hard to grind,just sprinkle some water. Before removing the channadal paste, add the dry roasted rolled oats,fennel seeds and grind it. Add the chopped onions, chopped green chillies, grated ginger pieces, curryleaves and salt, mix everything well. Meanwhile heat the oil for deep frying, take a small ball from the channadal-oats mixture, flat them in your palms and gently put them in hot oil. When i planned to make some cupcakes,i know i'll be making with my favourite fruit Orange and here its a peak season for oranges. Obviously we get few kgs every week and we start almost our day with a glass of freshly squeezed orange juice. Coming to this cute cupcakes, i prepared them with peanut butter and finely chopped white chocolate chunk, freshly squeezed orange juice.. Fresh orange juice,peanut butter and white chocolate, you wont believe me this combination works out tremendously prefect and we simply enjoyed thoroughly this very addictive cupcakes. Cupcakes usually have icing on them and they are supposed to be little mini cakes, muffins dont have icing and they are usually have fruits in it. Cupcakes are usually prepared for special occasions while muffins are usually prepared to enjoy anytime of the day.Some says that cupcakes will be lighter in weight when compared to the muffins. Muffins goes awesome with coffee while cupcakes goes prefect with a cup of tea.Coming to this cupcakes,if you dont have white chocolate,you can go very well to dark chocolate or milk chocolate,somehow i love here the addition of white chocolate. Do check Champa, Srivalli, Sumana Deepak,Veena and Preeti Deo wat they baked for the third day of bake-a-thon. Also check out the other bloggers running this 23rd edition of blogging marathon here.Sending these muffins to Kalyani's Magic Mingle with fruits and chocolate as this month's secret ingredients and to 60days of Christmas hosted by Priya and Divya. Line the cupcake pans with paper moulds. Beat together the butter,sugar, peanut butter together until they turn smooth. Now add the yogurt,orange juice and beat for few minutes. Sieve the flours with salt, baking soda and baking powder together and add gradually to the already prepared wet ingredients. Mix everything well with a spatula,dont overmix and gently fold the white chocolate chunks,orange zest to the batter. Spoon the cupcake batter to the paper moulds and bake for 20-25minutes or until a toothpick inserted comes out clean. Take the chopped white chocolate,fresh cream in a microwave safe bowl and heat for 2-3minutes, whisk well to turn as a white ganache. Once the cupcakes gets well cool, spoon the white chocolate ganache on the top of the cupcakes, sprinkle generously the sugar pearls. As i told earlier, my kids dont like to have their breakfast and sometime i have to compel them to have atleast a cup of warm milk with cereal bars. I know very well that i can feed them very much easily if i bake muffins with chocolate especially for their breakfast. 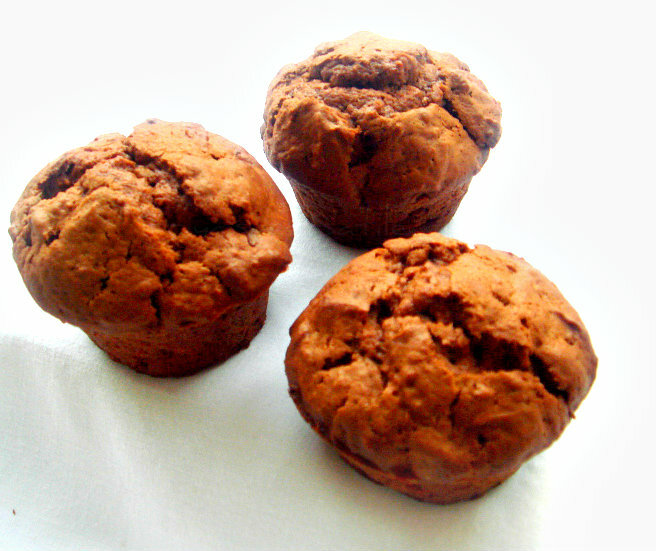 Obviously i'll try to add maximum fruits or veggies in their chocolate muffins so that they wont even notice the addition of fruits or veggies.For me, these breakfast muffins are quite an easy breezy way to feed them with the fruits or veggies. For my second day of blogging marathon, with eggless cupcakes or muffins with chocolate as theme, i quickly prepared this wonderful muffins and tried adding some finely grated apple and grated carrot to this muffins. 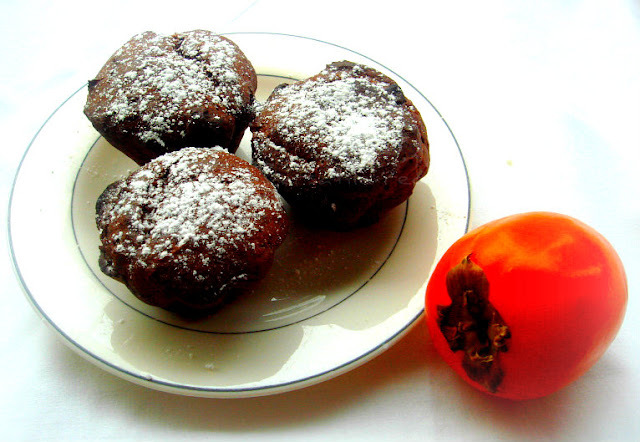 Both apple and carrot turned out this muffins super moist and simply delicious. None at home noticed the addition of apple and carrot and they simply enjoyed having their muffins with a cup of warm milk for their breakfast. Check out the other bloggers running this 23rd edition of blogging marathon here.Sending these muffins to Kalyani's Magic Mingle with fruits and chocolate as this month's secret ingredient and to my event Healthy Diet-Fast & Quick Healthy Dish guest hosted by Kalpana and to 60days of Christmas hosted by Priya and Divya. Meanwhile melt the chocolate with few spoons of water in microwave oven and mix it until you get a ganache. In a bowl, mix together the apple sauce,brown sugar, yogurt,oil and whisk until the sugar gets dissolved. Add now the melted chocolate to the wet ingredients and beat well. Meanwhile take together the flour,baking powder,baking soda ,cinnamon powder,salt and sieve it. Add gradually the dry ingredients to the wet ingredients,mix with a spatula. dont over mix. Finally fold gently the grated carrot and apples. Pour enough batter to the greased muffin mould and bake for 15-20minutes until a skewer inserted comes ot clean. Enjoy with a cup of warm milk. Once the cold weather starts, we can get this persimmon fruits everywhere here with cheap rates. Love this fruit and i never failed to bake with them if i get them abundant. Today am starting my first week of blogging marathon and this is my 2nd day of Bake-a thon,so obviously am posting an eggless muffins. For this week's blogging marathon, i choose eggless muffins or cupcakes with chocolate in it. If its chocolate based bakes, definitely am in. As everyone at home love chocolates in any form, i can feed them easily with anything. Coming to this persimmon muffins, i prepared this muffins last week for our breakfast and went for homemade persimmon puree with whole wheat flour and usual baking ingredients. If you are in hurry and dont have enough time to make your breakfast, prepare this muffins a day before and just enjoy to kick start your day. With a bowl of warm milk or a cup of coffee, this muffins will definitely goes for a satisfying breakfast or a snack.Do check Champa, Srivalli, Sumana Deepak,Veena and Preeti Deo wat they baked for the second day of bake-a-thon. Also check out the other bloggers running this 23rd edition of blogging marathon here.Am sending this incredible persimmon muffins to this month's Magic Mingle with fruits and chocolate as this month's secret ingredients.Thanks Kalyani for choosing this combo,i just love it.Sending to 60days of Christmas hosted by Priya and Divya. Beat together the butter and sugar for few minutes, add now the persimmon puree,canola oil,lemon juice,nutmeg powder,cinnamon powder and keep aside. 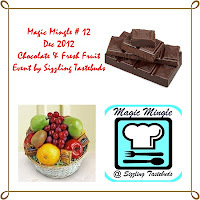 Meanwhile melt the chocolate with few spoons of water in microwave oven and mix it until you get a ganache.Add this melted chocolate to the wet ingredients and beat for few seconds. Mix together the whole wheat flour,all purpose flour,baking powder and baking soda in a bowl. Gradually add the dry ingredients to the wet ingredients until the flour get mixed,but dont overmix. Pour the batter in a greased muffin moulds and arrange over a baking tray.. Cool it completely and enjoy with a cup of coffee or tea.